A Death in the Dales is the 7th book in Frances Brody’s Kate Shackleton series of historical crime fiction books set in 1920s Yorkshire. Kate is an amateur detective. I’ve read the first two, Dying in the Wool and A Medal For Murder, and so I’ve jumped ahead in the series with this book. It’s not always possible to read a series in order and in this case I don’t think it matters – A Death in the Dales reads well as a standalone. It’s 1926 and Kate Shackleton’s friend, Dr Lucian Simonson, has offered her the use of his late Aunt Freda’s cottage in Langcliffe for a short holiday with her niece Harriet, who is recovering from diphtheria. Ten years earlier Freda had witnessed the murder of the landlord of the alehouse across the street from her house. A man was found guilty of the murder and hanged – but Freda was convinced that they had convicted the wrong man. Freda’s friend Mr Wigglesworth, the local apothecary, asks Kate to investigate the murder and gives her Freda’s papers regarding the trial. Although she had intended to have a holiday from her investigations she can’t resist looking at the papers and is convinced that Freda had wanted to her to solve the mystery and find out who had killed the pub landlord. As well as investigating the murder, Kate also helps Harriet and her new friend, Beth to find out what has happened to Beth’s young brother who has gone missing from the farm where he was working, and then a suspicious death on the same farm. 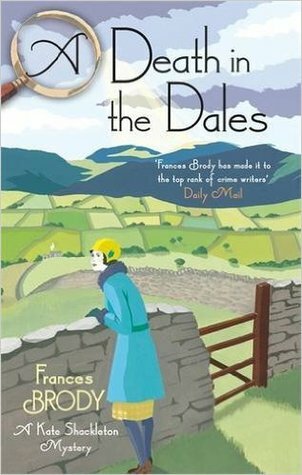 I enjoyed reading about life in the 1920s; Frances Brody paints a very believable picture of life in a rural setting in the Dales during the post World War One years. Kate is a very likeable character and has to overcome the suspicion of strangers from the local community once she starts digging into the past. And there is the added complication of Kate and Lucian’s personal situation. All in all it’s a complicated mystery with several strands, numerous suspects and plenty of red herrings. Frances Brody is an excellent storyteller and her books are well-plotted and complex murder mysteries in the historical setting of the 1920s and in the style of the golden age crime fiction. This sounds kind of like the Daisy Dalrymple series. I’d probably like it and will watch for the first book. Almost certain my library has it. I think you would like it Kay. I’ve read some of the Daisy Dalrymple series and enjoyed them too and also Jacqueline Winspear’s Maisie Dobbs series of books. Sounds like an interesting murder mystery! I might have to try the Kate Shackleton series sometime.